France 24 are reporting that four people were hurt in an accident on the Disneyland Paris Railroad train the W. F. Cody on Wednesday evening. Four people have been treated for minor injuries after a wagon broke off from a steam engine ride at Disneyland Paris, the theme park and police said on Thursday. The four, including a pregnant woman and a 13-year-old girl, were taken to hospital after the accident on the five-wagon Disneyland Railroad ride at 8:40 pm (1940 GMT) on Wednesday, a police source said. 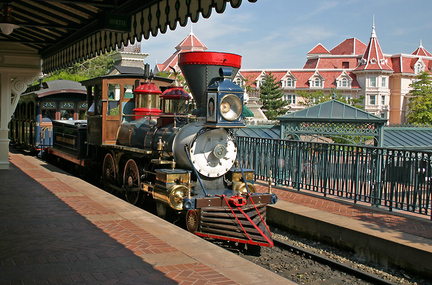 The source said the accident occurred after a bolt snapped between the first and second wagons of the train, the W. F. Cody sending the engine and one wagon ahead of the others as they approached the Frontierland Station. The three rear wagons struck the first section when it stopped at the end of the line. About 40 people were inside the train, which tours the theme park, at the time of the accident. A spokesman for the Euro Disney company, which operates the park, said the train ride was closed on Thursday and that the incident was minor. “It was a small nudge,” the spokesman said, adding that one wheel of the train had come off the rails. The spokesman said those injured were out of hospital and had returned home or continued their stay at the theme park. He said the accident had occurred at a “very slow speed” and said the train normally travelled at eight kilometres per hour (five miles per hour) when it was returning to the station. Next Next post: Orchard planted at Hotel Cheyenne.